Peach trees, Prunus persica, are originally believed to have come from China to the Mideast through the trade routes known to extend to Turkey and Iran (Persia). The peach seeds could be used to plant and grow trees throughout North Africa and Europe and finally were introduced to America in the mid 1500’s. The first appearance of peaches in China may date back to 2000 BC. Historians believe that peach trees were first introduced into the colonial settlements of the United States by the French explorers in 1562 at territories along the Gulf coastal region near Mobile, Alabama, then by the Spaniards who established Saint Augustine, Florida in 1565 on the Atlantic seaboard. The peach trees were planted from peach seed imported from Europe in an effort to establish a self sustaining, agricultural. fruit tree product to feed the colonists. American Indians spread the planting of the peach trees throughout vast territories by transporting the peach seed to other tribes that lived in the interior regions. This new crop of fruit was fast growing, producing a delicious peach two or three years from planting. The trees were so productive and vigorous that sometimes, widespread impenetrable thickets became established from the peach seeds that fell to the ground from fruit unharvested. The illusion was formed by settlers after 1600 that the peach trees were native to the United States, since they were so widely spread and grew so vigorously everywhere. Captain John Smith wrote about peach trees that were growing in Jamestown, Virginia in 1629. William Penn recorded in 1683 that dense, native thickets of wild peach trees were full of fruit just north of Philadelphia, Pennsylvania. Peach trees are grown primarily as a fruit tree; however, great interest in the non-fruiting, flowering peach tree was shown by President Thomas Jefferson who planted a double flowered tree that spectacularly bloomed at his home in Virginia in 1805. Flowering peach trees rate high, and desirable new cultivars of ornamental peach trees are available for planting and flowering with colors of white, pink, red, and peppermint (a mixture of red and white flower petals). These flowering peach trees are sterile in fruit production and bloom early in the spring, loaded with large colorful clusters of single or double flowered peach petals. Peaches are less popular as a fresh fruit than a few years ago, primarily because most commercial peach cultivars (varieties) are tailored by hybridizers to grow and ship as a firm fruit. The firmness of these peaches is important when a grower considers shipping the peach fruit long distances, but not enough attention has been given by plant hybridizers to saving the ancient qualities of aroma, juiciness, flavor, and seed separation from the pulp. Another problem damaging fresh peach sales is that the labor hired to pick the fruit from the tree is not properly trained nor personally concerned in the ultimate ripening of the peach fruit into a juicy, soft, delicious, tasty peach. The peaches are simply picked too soon and too firm to provide a fruit product that compared to a backyard orchard, tree-ripened delicacy that our older citizens often experienced in their grandfather’s back yard garden. Most of the peaches grown by commercial orchards today are fruits that are harvested while too firm with a seed that clings to the pulp called a “clingstone” peach. The best flavored peaches ripen soft and the seed easily separates from the edible portion, and these are called “freestone” peaches. Peach trees grown in the United States differ greatly from the aggressive, disease resistant, tasty, aromatic fruits grown by the early Americans. Over the centuries, the immune qualities of the peach trees to insects and diseases have been bred out by hybridizers, and these qualities have been replaced by inferior genes that make it difficult to buy a good flavorful peach at the store. The alternative to this problem is to buy tree ripened soft fruit at a fruit stand, pick-your-own orchard, or to grown your own backyard garden peaches concentrating on planting and growing old cultivars of the non-commercial home garden types. Peach trees in American have steadily declined in vigor in the past 300 years, to the point that the life expectancy is only 15-20 years or less. This factor has been explained by some fruit tree observers as due to an array of incremental factors, such as disease and insect weakening of the tree and leaves, nematodes, and improper soils and drainage; however, these problems pre-existed in the environment, when peach trees were introduced into America. The likely explanation of peach tree decline is more probably connected to the weak gene immunity that has appeared in peach tree hybridization focused toward commercial tree production that ends with an early, firm peach, clingstone, with shipping advantages to distant markets. The peach tree grows into a handsome canopy of dark-green rich foliage to a height of 6 to 10 feet. Most peach trees available in the United States are adapted and grown successfully in over 30 states. The grafted semi-dwarf peach trees are self pollinated, even before the flowers fully open, and the tree is cold hardy to negative 20 degrees Fahrenheit; however, the red to pink delicate flowers can be damaged by temperatures below 28 degrees Fahrenheit. Some orchardists like light frosts that will thin the bloom set, producing larger fruit. If extremely heavy flowering occurs, the excess flowers can be removed to 6 inch intervals, or by a chemical thinning that results in a much more marketable crop of fruit. A developing peach can grow in various sizes of individual fruits on the same tree that requires considerable grading before marketing. 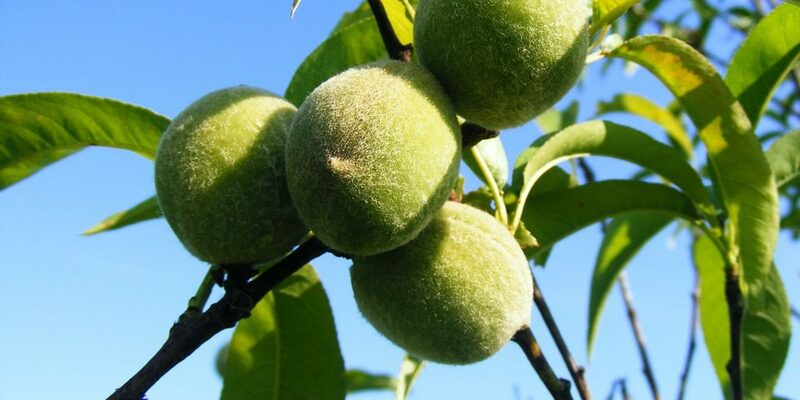 The peach is covered with a characteristic fuzz that some growers prefer to reduce or removed mechanically before sales. A nectarine is nothing more than a fuzzless peach, even though certain distinct cultivars of nectarines are offered. In his classic 12 volume book of botanical insight in 1921, Luther Burbank in Fruit Improvement believed that the peach had evolved from a nectarine-like ancestor with the fuzz developing as a shield of protection, unlike the fuzzless nectarine. He theorized that the fuzz shielded the fruit from sunshine, moisture, wind, insect, and disease damage. The nectarine, he felt, was repressed by evolutionary restraints, because the nectarine lacked fuzz as a protective armor. The cousin of the nectarine, the almond, was crossed by Burbank in order to create a nectarine fruit with an edible almond pit, thus two crops from one hybridization, a fruit and an edible nut. Burbank also performed many interspecific crosses of peach with nectarine. The peach is quite fragile and subject to bruising if handled roughly. Peach trees require a certain number of chilling hours in order to break dormancy properly and set a good crop of fruit. During a season most States will experience 500 chill hours in the winter; however, in many states, like central and southern Florida, the trees will not fruit properly unless cultivars are planted to fulfill low chilling requirements. It is very important to plant and grow peach trees on well drained soils. The fruit tastes better if trees are planted in the full sun, so that the early morning light will dry the dew on the peach leaves and fruit. Peach trees should be planted 12-15 feet apart in rows and will benefit by the application of lime and phosphate fertilizers around the ground beneath the branches. Weeds will be prevented in backyard orchards by heavily mulching, but otherwise the weeds should be mowed or sprayed with herbicides. Several kinds of peach varieties are usually planted to extend the availability and ripening of the fruit on the trees. Many cultivars are recommended for planting, such as: the Belle of Georgia, Elberta, Hale Haven, Harvester, Indian Blood Cling, Red Haven, Reliance, Gala, May Gold, Southern Pearl, Suwanee, Florida King, Florida Dawn, and many other low chill Florida fruiting cultivars. Peaches contain antioxidants that are important health considerations in maintaining healthy bodies. Many websites that recommend eating pits of peaches or apricots to prevent cancer should be urged to research the fact that the seeds contain a poison organic chemical, cyanogen, which produces fatal cyanide poisoning that has caused sudden death for many people, including Steve McQueen, a famous movie actor of the last century. Peach fruit has been demonstrated to contain healthy portions of Vitamin A, Vitamin B1, Vitamin B2, and Niacin. Peaches also contain the minerals Calcium, Phosphorus, Iron, and Potassium. Peach trees may be planted in various semi-dwarf sizes and ages for backyard fruit gardens and occasionally larger trees will grow fruit the first year of planting, but small trees usually begin bearing in the third year.